We-Care.com is a technology provider with a unique set of tools to help non-profits raise money. Boasting relationships with over 1100 stores and a client list containing over 400 non-profits, We-Care.com turns supporters' everyday online shopping into donations. The tools are free for both the non-profits and the supporters. Supporters choose a cause, download a browser extension, and shop as usual. Using affiliate advertising relationships, We-Care.com receives referral commissions whenever a supporter makes a purchase. We-Care then splits this commission with the supporter's chosen non profit. 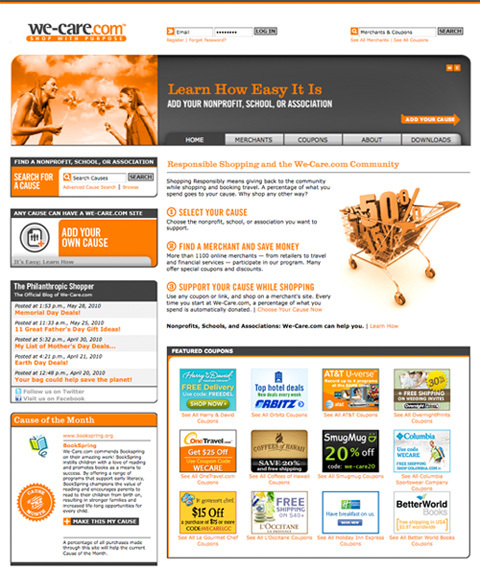 A fully co-brandable charity-coupon mall, We-Care.com creates a new, custom shopping portal for each of its non profit clients. The most fun set of tools I've ever built, the full suite of solutions includes the online mall, two browser extensions, a custom written DNS server, and a custom written proxy module based on the SQUID Proxy Server.